Streamline your food product development process – manage supplier specifications, formulate recipes and create labels. Scroll down this page to see how it works. Configured specifically for your country and type of business. Build a single source of truth for your ingredients. Use our ready-to-go nutrient databanks or ask suppliers to add their ingredients online. Create recipes quickly and easily. 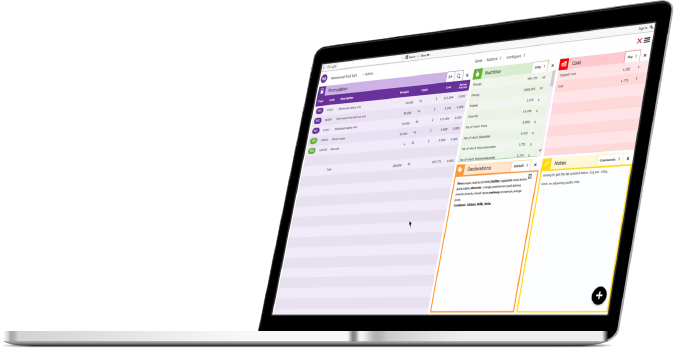 Immediately see the impact of any changes on cost, nutrition, allergens, ingredient lists and more. Automatically create recipe information sheets, finished product specifications and labels. Use the extra time you’ll free up to create more and better recipes. Create processes that streamline your business more and more.